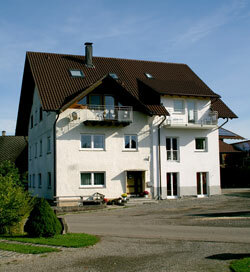 Welcome to our organic farm between Allgäu and Lake Constance. From here you can reach the most beautiful destinations in the Allgäu Alps and Lake Constance region in a short time - if you like by bicycle or on foot. Spend your next holiday in one of our four hand picked vacation rentals. By appointment, you may also like to visit us in the barn and in the distillery. We produce on our organic managed farm raw milk, raw milk cheese, sausage, beef and fruit brandy. In addition to cats and our donkey Romeo we live on the farm along with 75 dairy cows, 15 calves and 45 cattle.